There are two things that I remember vividly from our arrival in Nicaragua. 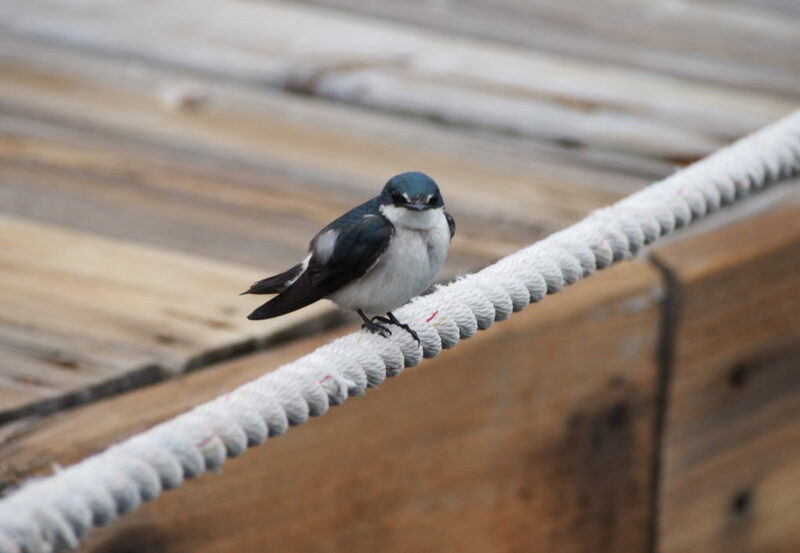 First, the tiny tree swallows fluttered along with the boat as we made our way down the long, narrow estuary. They landed on our rails and lines and chirped, chirped, chirped. Second, it was cool. The air hasn’t felt cool in many months, and Philippe and I reveled in it. We hoped it would always be cool, which was not the case, but we did have a few mornings and evenings where the temperature and humidity were bearable. Originally our only planned stop in Nicaragua, Puesta del Sol is a resort / marina combination. We had heard from S/V Pineapple that the WifI was good. Our friend, Victoria, from S/V Taliesen Rose, has spent many weeks in this part of Nicaragua. Her friend owns Rise Up, a surf and yoga camp for women. She raved about the town and gave us lots of recommendations, which made our stay feel really seamless. Checking into the country is a little funny, since a few people from immigration have to drive 2-hours to come see your boat. Philippe said that he sat in a chair in the office where each of the four Nicaraguan officials have their own desk. They talk in fast Spanish (again, in a dialect that is so different than Mexico and so hard for us to understand), mostly without speaking directly to you. Then, they come to your boat and poke around a bit. They asked if we had vegetables or guns (no), and opened one cabinet (oddly enough, they selected the engine compartment, so inspecting it was pretty straightforward). One person said he had a headache, so Philippe offered him some medicine. He turned the Advil bottle over in his hands a few times and commented that it was good stuff. He was really playing up his headache, so Philippe asked if he would like a few pills to take home for the evening and offered him a sandwich bag. The customs official probably emptied 100 pills into the bag ☺. Shortly thereafter, we were trying to make exact change (you need to make exact change for four different offices, so small bills are important!). We had a $2 bill, which one of the men asked if he could keep (not as part of our fees, just as a souvenir). Sure. This was all made even funnier when we checked out, because the official who came on the boat complained of a headache (“I’m so sorry!”, Philippe said). Philippe did offer him a beer, which he declined, but indicated that Philippe could pay him the value of the beer. He also accepted a piece of cake in a sandwich bag, which he stuffed into the pocket of his pants (think about that for a second: a piece of frosted cake in 90-degree weather, stuffed into your pants pocket. Was he going to eat it in the car on the trip back? Or was he going to sit on it for 2 hours until he got home?). All in all, we have no complaints. We’ve heard that some countries will shake you down for a lot of money or goods, so we’ll just enjoy this story. If you’ve been reading the news, you may or may not know about the current political strife in the country. It doesn’t seem that US new outlets have reported on it extensively, but the NYT ad a few other publications have run articles. There was a lot of talk in the cruising community about whether stopping in Nicaragua at this time was a safe choice. Luckily, we were able to reach out to our cruising community resources and ask about the current state of affairs near Puesta del Sol, which is about 2.5 hours from the cities where the protesting was most notable. Our friends reported feeling completely safe, with no signs of unrest in the areas we would visit. We can confirm that this is absolutely the case. There was only one sign that things were unusual, which was that Puesta del Sol was a total ghost town. To be fair, it is low season in Nicaragua right now. It’s very possible that the resort would have been empty even without political unrest. But we did talk to a person who worked in the hotel industry and said that almost all reservations to his hotel were cancelled after the protests started. We were in Puesta del Sol for six days. In that time, we saw two other sailboats with a total of four people on them (including our friends, S/V Xenia, from Bahía del Sol in El Salvador). We didn’t see a single person stay in a resort condo. I would estimate that we were outnumbered by staff 5:1. For us, this meant that we had unlimited use of the resort facilities, which included a breezy palapa restaurant, two pools, and a game room with ping pong. We didn’t have any big thunder storms, but there was rain, and it wasn’t as predictable as in El Salvador. My two favorite guys hanging out at the pool (Yuki was not a fan of sitting on the column surrounded by water). The main pool overlooked the estuary and the marina. The best part, however, was town. Aserradores is a cute little surf town. We spent time at La Sirena, a restaurant that serves amazing food on Saturdays and Sundays, and Joe’s Place, a hostel that has delicious $5 dinners every night. While we love hanging out with our cruiser friends, it was a nice change of pace to be around a bunch of surfers. For one, cruisers (on average) skew towards retirement age. Surfers tend to be in their 20s or 30s. We met people from Germany, Canada, and Australia who had sought out Nicaragua’s coastline, which features great surf breaks. On my birthday, we rented some surf boards from Tapas y Surf, a super cute shop right on Nahuala Beach. We were recommended Nahuala for its gentle but consistent waves and its ease of access. Instead of having to paddle all the way out to the break, Nahuala has a long, shallow, sandy landing. You can walk all the way out to the biggest break to wait for your waves. We opted to walk only to the second largest break, which seemed perfect for us. We didn’t have an instructor, so we just spent a couple hours doing our best, which wasn’t very good. We each stood up a few times, though, and all in all I would say it was a success. If nothing else, it was fun. Afterwards, we headed back to Tapas y Surf to enjoy their $5 breakfast. I loved the “typical breakfast” (“typico”), which was two friend eggs, fried plantains, and red beans and rice. I took a loose day off of work for my birthday, where I still answered chats from colleagues and emails from clients, but didn’t work on any hiring or long-standing projects. I spent the day writing, reading, and eating the most delicious birthday cake that Philippe made me. He really spoiled me, with both homemade yogurt in the morning (I swear, it was the best yogurt I’ve ever eaten) and a homemade cake (made with a Mexican chocolate cream cheese frosting) in the afternoon. In the evening, we went into town based on the recommendation of Taliesen Rose, who told us that Salsa Night at Pasta la Vista restaurant was super fun – and it was! I was also thrilled to find chicken wings, which were popular in northern Mexico but we haven’t seen in several months. Unlike northern Mexico, Nicaragua even serves them with blue cheese! It’s currently 5am and I’m watching a cotton candy sunrise as we travel from Aserradores to San Juan del Sur. We didn’t initially plan to stop there, but the surfers said such great things, and the town looks really cute. Unlike our last few stops, it’s a little more hip and touristy, boasting things like a café, a chocolate museum, and a smoothie bar. Cell phone connectivity – Ehhh…. This left something to be desired. We bought the Claro SIM cards in El Salvador, and the great news is that they will work all the way through Costa Rica. Marina Puesta del Sol is at the edge of town, however, so reception wasn’t great. I did find one spot where my phone picked up good coverage, however: the tennis courts. And that’s how I found myself working from my “tennis court office” for several days. Wi-Fi – The resort Wi-Fi was a little spotty, but generally good enough to get by. There was one silly caveat. The resort is powered by a generator, which is very expensive. Since no one was staying there, Puesta del Sol shut down the generator every day from 4-7am. I often start my work days early, but with the generator (and thus, the Wi-Fi) off, I couldn’t really get to work until at least 7. Restaurants – La Sirena had great drinks. We also really enjoyed the chicken and waffles. Joe’s Place was a big hit with us. The brochette chicken was worth so much more than $5. It was also tough to find beer at the small tienda’s in town, but Philippe and Keith managed to catch the distribution truck and purchase 36 beers. Everyone had a good laugh over it. To Do – Go surfing! It’s so accessible. At its peak, Nahuala Beach only had 12 people surfing, and since the space is huge we never felt like we were in anyone’s way. Again, it’s off-season, so maybe that’s not representative of all days. Surf board rentals were $20 / person / day at Tapas y Surf, but since we rented 3 boards Philippe was able to negotiate a deal.